♫ Dum dum da dum...dum dum da dum! ♫ You hear that? That's the sound of the upcoming wedding season that is nearly here! For lots of us, we are invited to weddings during the summer. 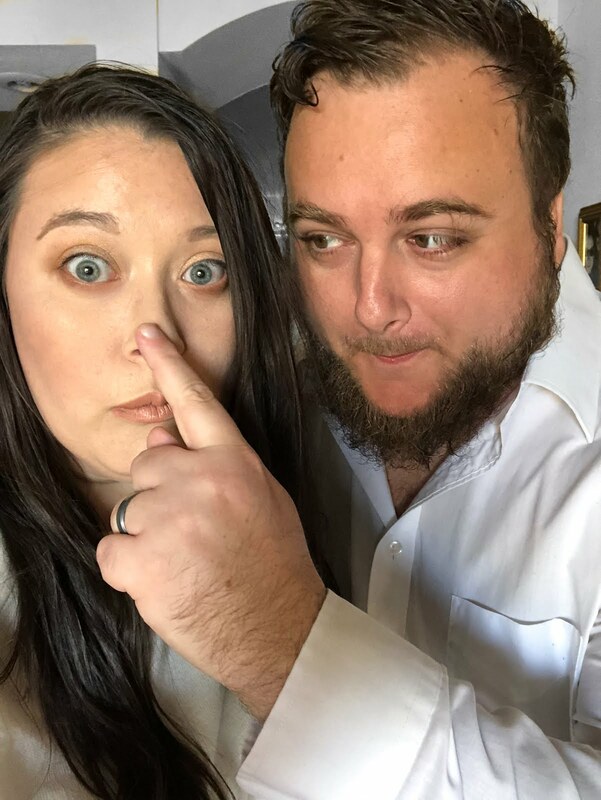 Weddings can be fun, they can be exhausting, they can be inspiring, or they can be just downright expensive. But something we can all agree on--they can have cake! Yes, I love to see two souls come together and devote their lives to one another. Yeah, that's so beautiful to witness! Totally! But, I'd be kidding myself if I said that the wedding cake wasn't one of my favorite things about a wedding. 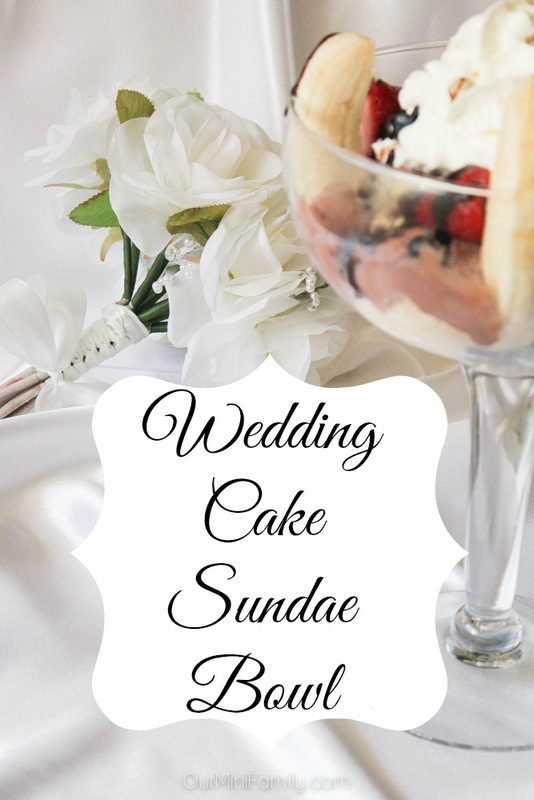 Today, we're sharing our Wedding Cake Sundae Bowl! Pre-heat your oven to 350 degrees (Fahrenheit), and put 2 non-stick square baking pans of the same size on top of the stovetop to get warm (these are the pans you will fill your cake batter with). Leave the eggs and milk on the counter for a few minutes to get room temperature. Combine the milk, eggs, and the extracts together. Mix in blender for 1-2 minutes. Add in your flour in to the mixture about 1/2 cup at a time, and keep blending as you add. Continue to add in your flour in increments until it's entirely in the bowl. Combine the sugar, baking powder, and salt separately--then pour them and mix them into the batter. 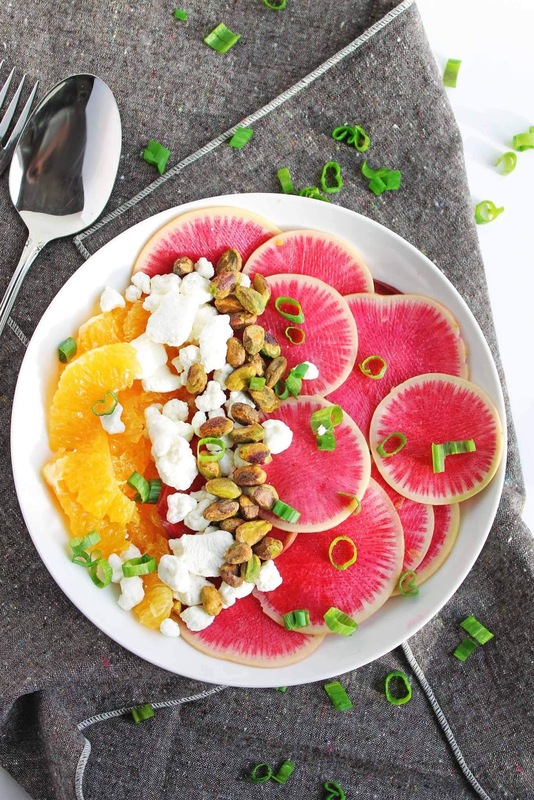 The final ingredients you will add is the vanilla bean olive oil. Have your batter mixing on low-medium speed. Slowly pour your 1/2 cup of olive oil in first. Let it mix. Then add in final tablespoon, mix, and then stop mixing. Immediately fill your baking pans after. Fill your 2, non-stick square pans with your cake batter. Bake for 25 to 30 minutes. Check often after 20 minutes mark to see if it's done. You can stick a fork or toothpick in the center of the pans, and if the fork/toothpick comes out clean then it's done. 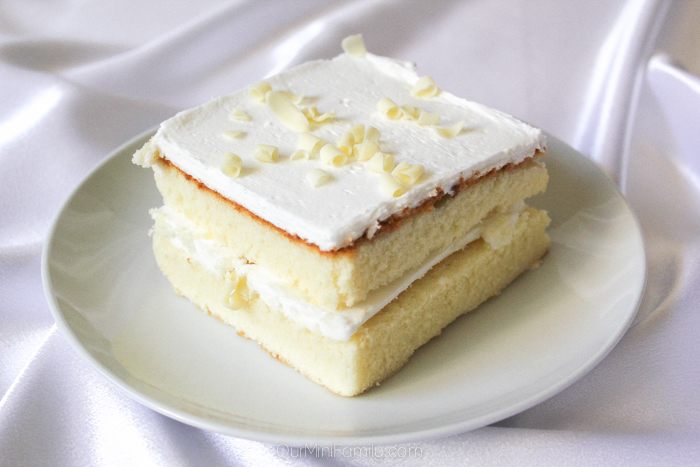 Remove cakes from oven when they are done, and allow them to cool for a few hours. 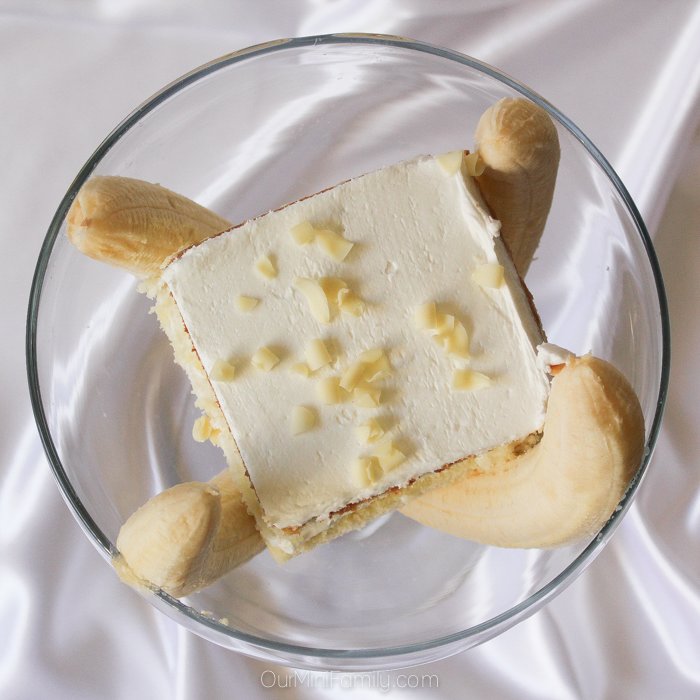 Shave your cakes and prep them for layering--layer with your favorite vanilla frosting and a piping bag. Outline the edges of the cake with frosting in a large square, and then work your way to the center to adhere the 2 layers together. 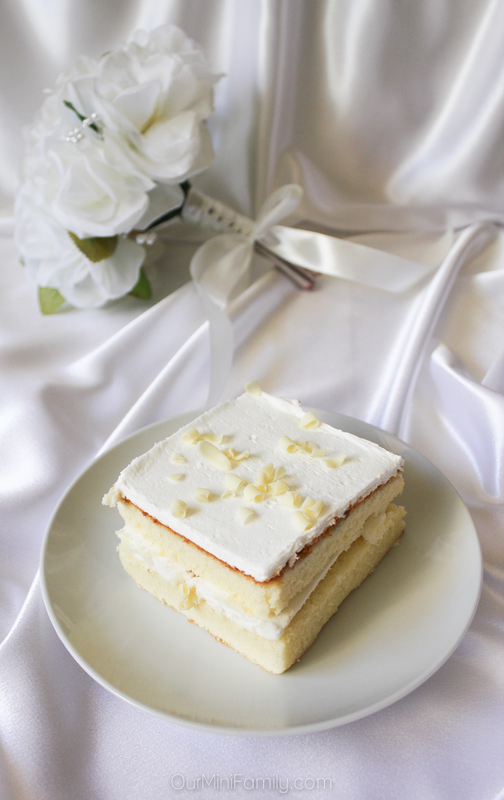 Top with more frosting, and then garnish cake with white chocolate shavings. And this cake tastes great both alone, and topped with ice cream in a sundae! 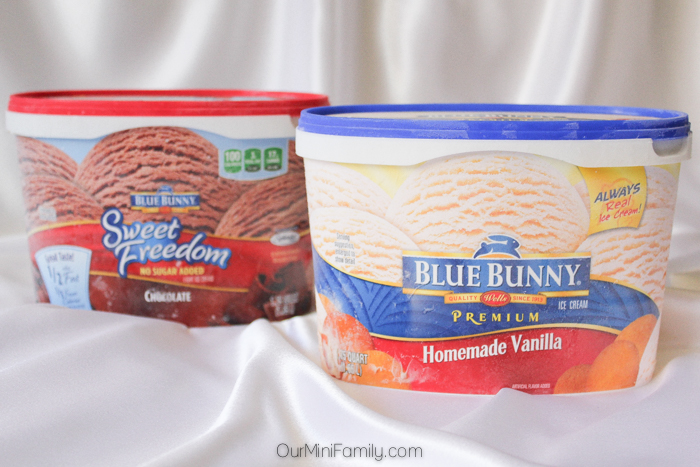 The Blue Bunny Ice Cream is one of my favorites, and I like to have at least a half gallon on stock in my freezer at all times. Sometimes Adam and I like to have a spontaneous sundae date, so when I head down to Walmart to buy groceries it's pretty normal for me to have Blue Bunny Ice Cream on the grocery list. This past week when I went out to get my ice cream, there was a Blue Bunny demo (featuring Vanilla Ice Cream and Fresh Berries) at Walmart. 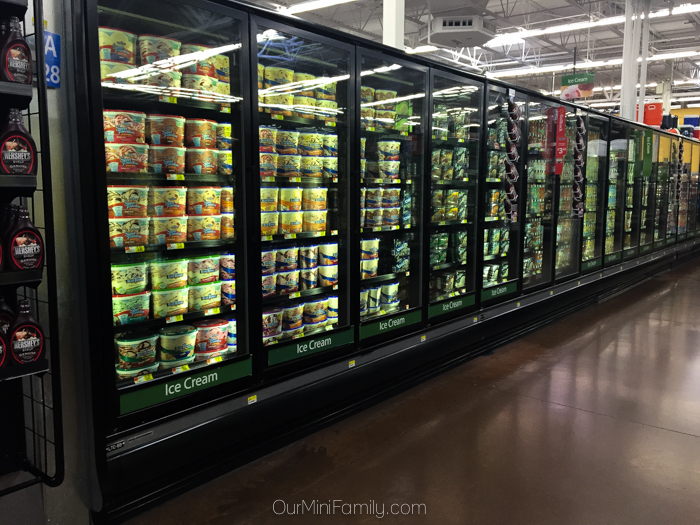 Walmart demos can be a nice surprise to make grocery shopping more fun--whenever I see one, I always like to stop because there's usually a sample and sometimes even a coupon (depending on the vendor)! 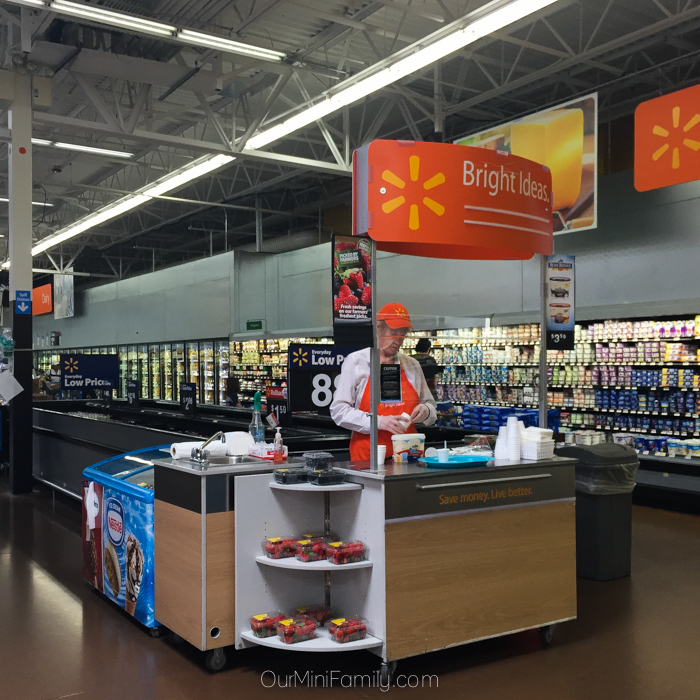 From June 4-7, Walmart is holding a demo for Blue Bunny Premium Vanilla sandwiches and Wet Ones. Follow Blue Bunny on Twitter, Pinterest, Instagram, Facebook, Google+, or YouTube! 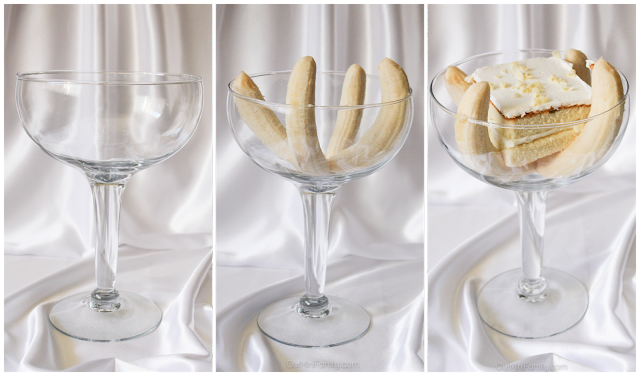 Once you've decided which flavors of ice cream you want to have in your sundae with your wedding cake, find a large bowl to use and fill it with bananas and your cake (we bought our bowl at our local craft store). Now comes the fun part! 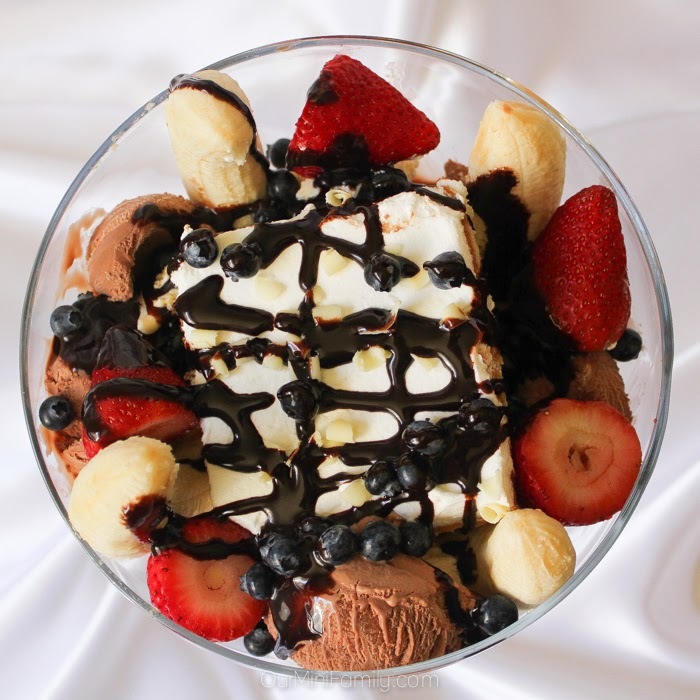 Filling your sundae bowl with ice cream and toppings is a blast! 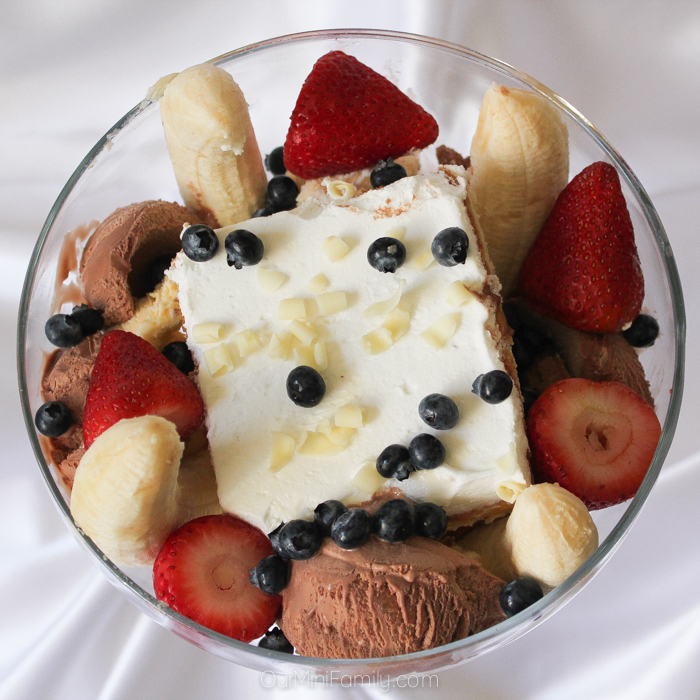 My favorite flavors of Blue Bunny Ice Cream are Homemade Vanilla and Chocolate--which are what I used in my Wedding Cake Sundae Bowl! Then, I added in some fresh strawberries and blueberries! And then I went nuts with some chocolate sauce! YUM! 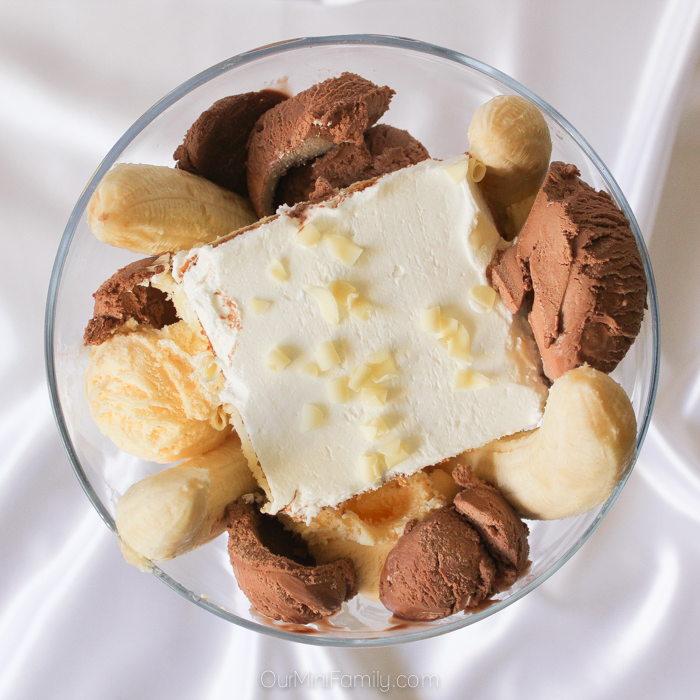 Top it off with some whipped cream and black walnuts and voila! 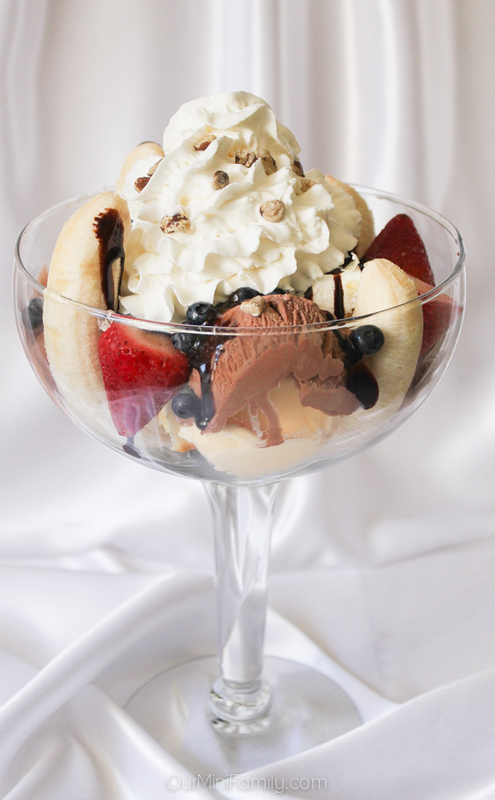 What do YOU like to put in your ice cream sundae? That looks so pretty! Lovely! My mouth is watering. Yum! It tastes as good as it looks, too! This looks amazing! No weddings in sight for me but I just might make this anyway! I'd be happy with just the cake even, but the final product looks out-of-control delicious! Right?! Yes, the cake by itself is bomb and the sundae is DA bomb dot com. Oh my gosh so cute!! Wow that looks so decadent! You are most welcome, Rianna! This looks wonderful and perfect for my sister's upcoming wedding.